Microsoft's Windows Phone platform may effectively be dead at this point, but don't despair: You can still get a fantastic Microsoft experience on your mobile device. You just have to look to an unlikely bedfellow. With Windows Phone (a.k.a. Windows 10 Mobile) out of the picture, Microsoft is devoting an ever-increasing amount of energy to creating its own mini-platform within Google's Android ecosystem. And given Android's immense flexibility and customization potential, that opens the door to some pretty compelling possibilities. With the right set of apps, in fact, you can basically create a Windows-centric environment on any Android device — with everything from the services you adore to the phone-to-PC harmony you crave. Here are the ingredients and the steps to get started. The core of your Android setup is your home screen — and the app that'll turn it into a hub for your Microsoft-Android experience is the aptly named Microsoft Launcher. 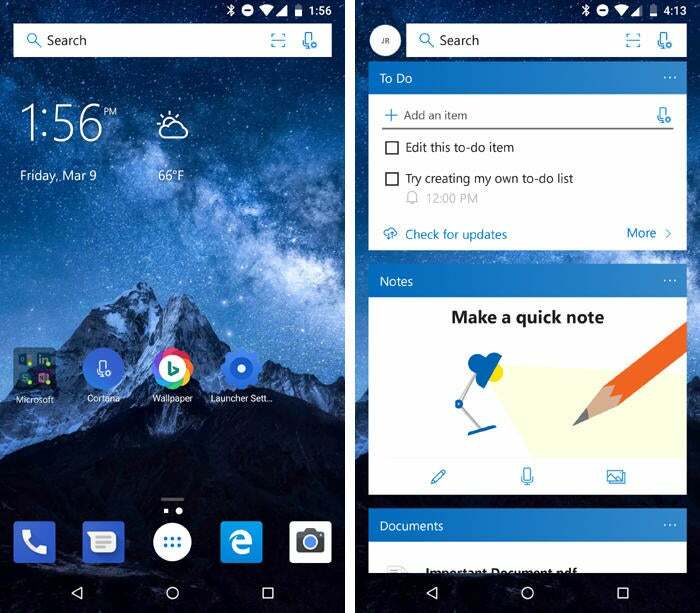 On the surface, Microsoft Launcher has the same sorts of features you'll find in other Android launchers — the typical tools for customizing your home screen's appearance, creating gesture-based shortcuts, and so on. But beyond that, it adds a hefty dose of Microsoft into the mix, with Bing-powered search (by default), one-tap access to Cortana, and prominent placement of recommended Microsoft apps. To the left of the main home screen panel, meanwhile, sits Microsoft's take on the Google Feed — a card-based collection containing items such as news, weather, agenda info, and quick glances at your notes, tasks, and recent documents from the appropriate Microsoft services. You can even send a document directly from there to your PC and have it pop up immediately using the integrated "Continue on PC" option, provided your computer has the Windows 10 Fall Creators Update installed. The Microsoft Launcher's main home screen panel and feed. Missing the Windows Phone look? Try SquareHome 2. The launcher — which isn't actually developed by Microsoft — emulates the tile-centric "Metro UI" from the Windows Phone platform. You'll sacrifice the tight integration with Microsoft services provided by the official Microsoft Launcher, but if your phone's interface is a top priority, you might just be happy with the tradeoff (even if only for an occasional bit of weekend nostalgia). 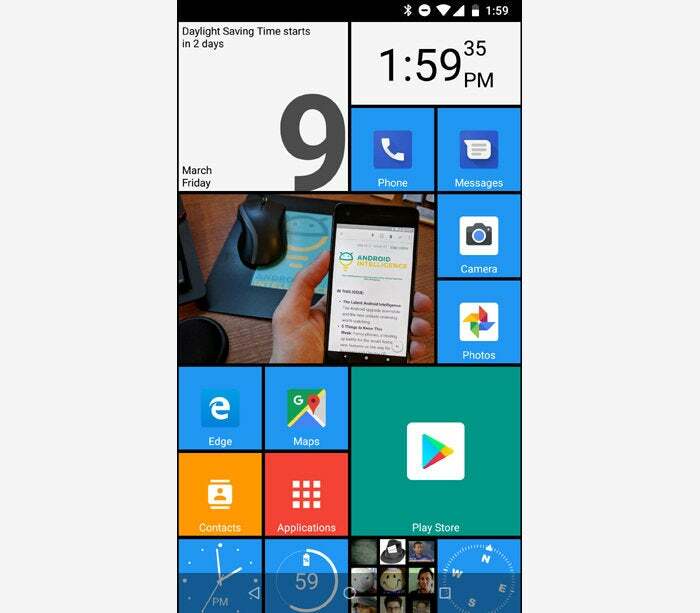 A taste of Windows Phone on Android via the SquareHome 2 launcher. For full PC-to-phone synchronization, you'll want to be sure to link your Android phone to Windows by following the steps in the Phone section of your computer's Windows 10 settings (assuming you have the Fall Creators Update). 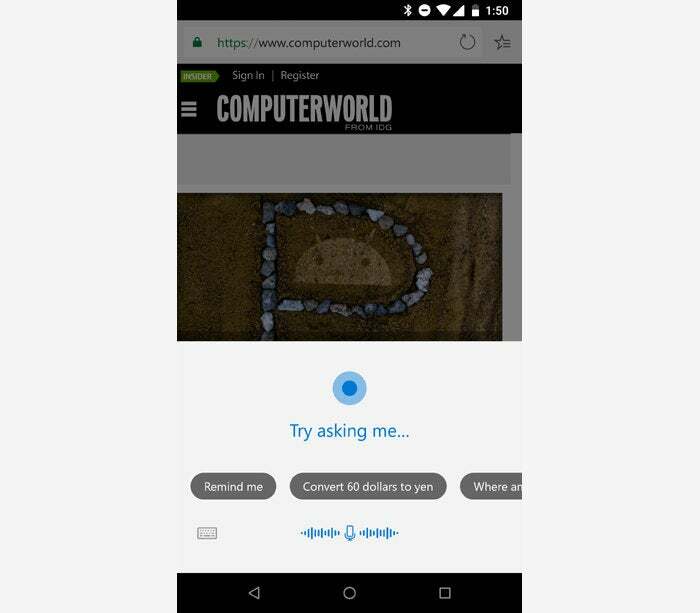 You'll also want to get the standalone Android Cortana app, which has lots of overlap with the Microsoft Launcher but provides a series of controls in its settings that'll let your phone's notifications appear on your PC. That'll allow you to receive and reply to texts and even see missed calls right from the Windows 10 Action Center. There's more to come on this front, too: Microsoft is on the brink of releasing a new Windows update that's expected to add a slew of fresh PC-to-phone connectivity features. A component called Timeline will save snapshots of your progress in different apps and then let you pick up exactly where you left off on other devices — starting on your desktop and then moving to your phone, for instance, or vice versa. Another expected element would create a cloud clipboard that'd let you copy text on one device and then paste it on another. That update, believed to be dubbed "Spring Creators Update," is expected to arrive by April. Download Microsoft Edge. The cross-platform browser will give you a decidedly Microsoft-like framework for web browsing — one that'll be relatively consistent from your mobile device to your desktop computer. Like the launcher, Edge makes it easy to move content between your phone and PC (assuming, again, that your computer has the Fall Creators Update). Beyond that, it automatically syncs your history, favorites and reading list — a built-in system for saving articles to read later — so you can seamlessly move between different devices. Microsoft's OneDrive is built into Windows 10 — and with a couple of taps, it can be built into your Android device, too. Grab the OneDrive app and have easy always-synced access to your files, no matter where you may roam. Microsoft's Office apps on Android have come a long way. These days, the Android versions of Word, Excel and PowerPoint are fully featured, polished and pleasant to use. Plus, if you're already living in Microsoft's universe, they'll give you a completely consistent experience with your desktop-based software and let you work on your files from any device without the need for conversions or adjustments. Don't forget, too, that Outlook and OneNote are both available on Android. If you're using either program on your Windows desktop, you'll probably appreciate having it on your Android phone. Cortana is part of Microsoft's Android launcher, but a launcher is relevant only when you're on your actual home screen. With a quick visit to your device's settings, you can set Cortana to serve as your device's default assistant — and thus be accessible via the same systemwide commands typically occupied by Google Assistant (such as pressing and holding your Home key, on many Android devices). Start by opening the Apps section of your system settings, then scrolling down until you see the line labeled "Default apps." (You might first have to tap a line labeled "Advanced" to get that to appear.) Tap "Assist & voice input," then tap "Assist app" and select Cortana — the one with a microphone in its icon — from the list. And there you have it: Microsoft's soft-voiced virtual lady will be at your beck and call, wherever and whenever you need her. With a couple quick adjustments, Cortana can help you anywhere in Android. Want to use Cortana by default without installing the Microsoft Launcher? Make sure you have the standalone Microsoft Cortana app installed, then follow the same steps described above but select the Cortana with a circle in its icon. The standalone Cortana app also has options for creating a floating Cortana button that'll appear on your home screen and lock screen, should such possibilities intrigue you. Got a recent Samsung Galaxy phone? If you want to remap that silly Bixby button so it'll pull up Cortana, try the third-party Bixby Button Remapper app. It's free with an optional $2.99 in-app upgrade that'll let you keep the button from being pressed by accident while your phone's in your pocket. Make your life a little easier and let your phone serve as the key to your Windows 10 computer with the Microsoft Authenticator app. Authenticator can act as a regular two-factor authentication code generator, but it also has the ability to let you avoid entering your Microsoft password entirely and instead authorize access to your computer simply by unlocking your phone and approving a notification. The feature is available only for personal Microsoft accounts. Use Microsoft Photos at home? Microsoft's Photos Companion provides a way to transfer photos and videos from your phone directly to your PC using Wi-Fi. 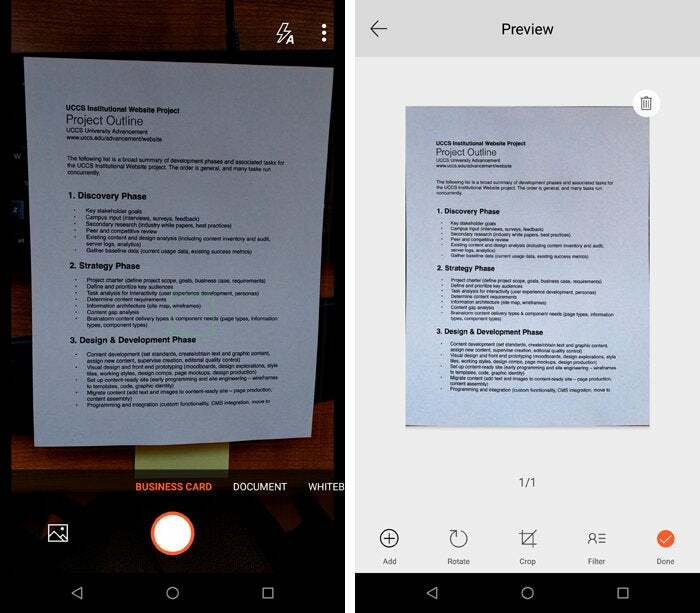 If you find yourself needing to scan physical documents or whiteboards often, Microsoft's Office Lens app is up to the task. It'll crop and clean up such snapshots and save 'em as PDFs, Word files, or PowerPoint files — in OneNote or OneDrive or even just on your device's own local storage. Office Lens simplifies the process of capturing physical documents and saving them to your Microsoft storage. It's not the best all-around to-do app on Android, but Microsoft To-Do has the unique advantage of syncing up with the rest of Microsoft's ecosystem — including the same-named app on Windows 10. The long-excellent SwiftKey Keyboard has been under Microsoft's wing since 2016. It doesn't have much in the way of Microsoft-specific integration just yet, but it seems likely that'll happen eventually (and it's a great keyboard to use, regardless). Want to translate languages without leaning on Google? Microsoft Translator is standing by and waiting to say bonjour. Last but not least, if you're truly going all in with Microsoft, the Microsoft Bing Search app will make sure Microsoft's take on search — complete with news, recipes, and even barcode lookup — is always just a tap away. 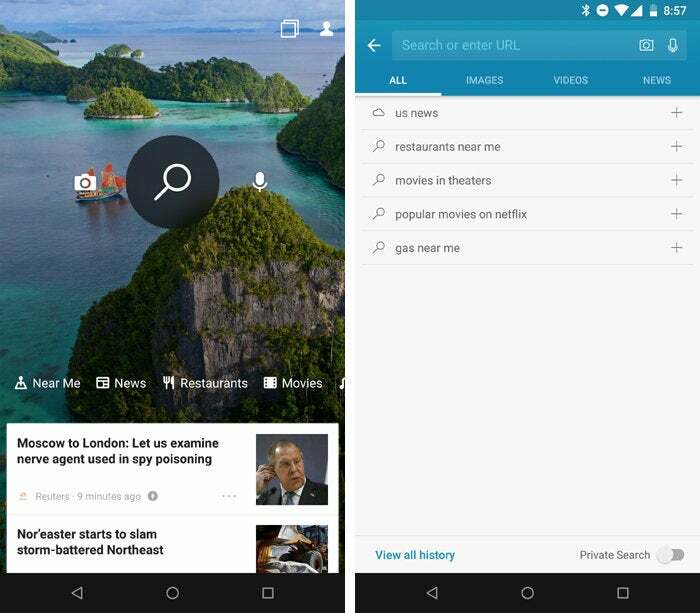 Microsoft's Bing Search app brings the full Bing experience to your Android phone, complete with customizable tabs for your own search interests. And a footnote, just for funsies: While I can't recommend this for your own device (for obvious reasons), an unofficial Clippy app brings the original Microsoft assistant into the realm of Android — hovering on your screen and irritating you endlessly with its unwavering stare. Keep it in mind for the next time your co-worker accidentally leaves his phone unattended.